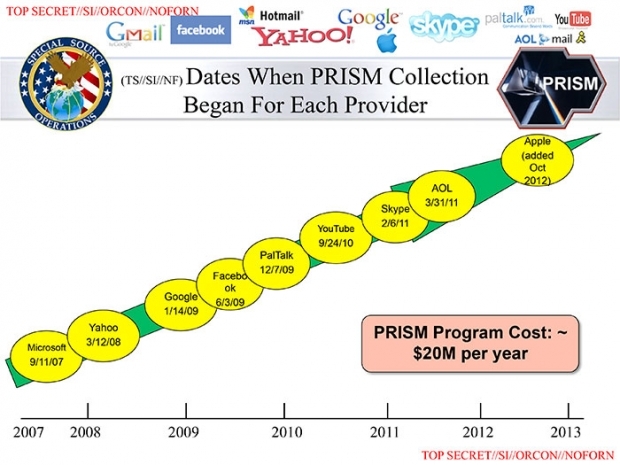 This leaked NSA slide, explaining the PRISM data-collection program, shows when each tech company joined the program, with Microsoft being the first, on Sept. 11, 2007, and Apple the most recent, in October 2012. This story by Wendy Qian was originally published by Tea Leaf Nation. The online reactions to the PRISM incident, in which the U.S. National Security Agency (NSA) has been revealed to conduct a far-ranging surveillance program affecting many both in the U.S. and abroad, have been as fascinating as the event itself. And that’s not just true of American netizens. The logo of PRISM, a clandestine national security electronic surveillance program operated by the U.S. National Security Agency since 2007. Some users like @saoako connected this incident to a debate on broader issues: “Personal information freedom has been ‘democratized’!!! The NSA’s spyware has been exposed; our country has also been served by the Boundless Informant [sic].” The post included a link and a graph showing how China ‘enjoys’ the same level of treatment by Boundless Informant, a spyware system, as the United States. American politicians seem to have secretly allowed the NSA to monitor foreign Internet activity. This sort of action will allow domestic high-tech companies to gain an advantage! Since America mentioned cyber-security first at the recent ‘Sunnylands Summit,’ this discussion will no doubt escalate and play out in all different types of business issues. This does not necessarily bode well for the United States. Weibo user 精神病医院洲哥 posted a picture of Peng Liyuan, Xi Jinping’s wife, and wrote: “All information sent by Apple products could be inspected by the NSA. First Lady, you should change phones!” Internet entrepreneur @飞象网项立刚 posted: “I read FT’s article [arguing that] Sister Peng should change her cellphone. The issue of security has very little to with ideology; every country should be careful about it…The NSA spent US$2 billion on a data center to collect information from iPhones.” Ms. Peng has been a wide subject of Weibo chatter, and many users made this connection. I am no longer that fond of Google, especially after PRISM, if the FBI and NSA’s notice about ‘inspecting users other than Americans’ is true. Think about how much of our private information has been sold by Google. America only has around 300 million people, but even if Google’s China search service only amounts to a few percent points, that would be a lot of netizens. Furthermore, some people use all of the services Google provides. I have been betrayed. Some users have jokingly noted that American dissidents may soon seek asylum in China, just as Chinese citizens like Chen Guangcheng have sought protection in the United States. When the PATRIOT act was passed, liberalism could not defeat it. Now, PRISM could help liberals defeat it ex post. Where there are people, there will be people trying to infringe upon individual liberty in the name of efficiency. Some people may say, for the benefit of the group, you should die. Americans have not become that extreme yet. But maybe in the long run, with the state of technology at present… that extreme make take form.